Some 35 students from a mix of local colleges and high schools are set to receive scholarships valued at $4.3 million for the upcoming academic year, from the Hanover-based Tryall Scholarship Fund. 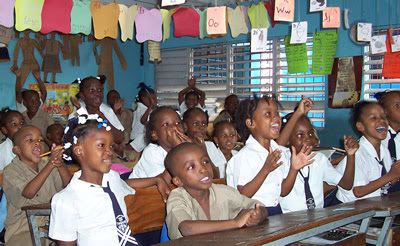 Developed and supported by the management and staff of the Tryall Hotel, the fund is aimed at improving the lives of students, particularly in Western Jamaica, through its education, health and welfare projects. Guardian Life has awarded $50,000 scholarships to GSAT whiz kids Michael Bradshaw and Nethaneel Campbell, two of the most outstanding students who sat this year's exams and are heading off to high school. Top performing students from the Denham Town and Alpha Primary Schools were awarded bursaries each worth $25,000. The presentations were made during an awards luncheon last Wednesday at the company's New Kingston offices. Among the highlights of the recent 61st staging of the Denbigh Agricultural Show in Clarendon was the National Farm Queen pageant, where the home parish's entrant Nordia Lewin was declared the winner. The 23-year-old CASE grad was selected over Lushaun Lugg (first runner-up, St. Ann) and St. Thomas' Tahera Brown, who took third place.